There are two people named Jeff Ball currently active in the music world. 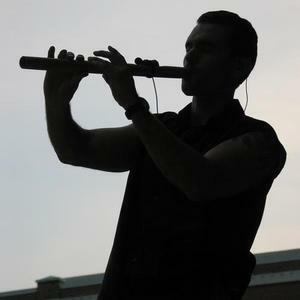 1) Jeff Ball (born August 6, 1966 in Bethesda, Maryland) is a native american flute player. 2) Jeff Ball (born December 19, 1984 in Kodiak, Alaska), also known as some1namedjeff, is a professional violinist, composer and sound designer for video games, and a video game music remixer. 1) Jeff, the native american flute player, was born and raised in Rockville, Maryland, and is still a resident of that state. 1) Jeff Ball (born August 6, 1966 in Bethesda, Maryland) is a native american flute player. 2) Jeff Ball (born December 19, 1984 in Kodiak, Alaska), also known as some1namedjeff, is a professional violinist, composer and sound designer for video games, and a video game music remixer. 1) Jeff, the native american flute player, was born and raised in Rockville, Maryland, and is still a resident of that state. He comes primarily from a Scotch-Irish heritage with "according to family legend, a few drops of Indian blood, just enough to help me play wood-flute." Jeff grew up listening to both pop music and smooth jazz, but after he went to a powwow and heard a Native American flute player, "I couldn't get enough of it." Ball got his first flute in 1992. "I knew some Indian groups in Virginia and they introduced me to a Choctaw flute player named Windtamer who gave me some valuable tips early on. I read everything I could get my hands on about the Native American culture and history. At Indian gatherings I listened to the stories; I joined them in sweat lodges; and I got some sage advice from a Chipewa medicine man." Over the years Ball has become one of the genre's most influential flutists and is known for stretching wood-flute playing to new limits. Also spreading Ball's reputation is a book he wrote about playing this type of flute. First published in 1994, TRAILHEAD OF THE AMERICAN COURTING FLUTE remains the basic instructional primer (it comes with a CD). Ball's first album was a solo flute recording, DANCING IN THE WIND. With his next album, MIXED BLOOD, he included his brother on bass and some other instruments. These albums were followed with mostly ensemble recordings: REVERENCE, WINDTAMER (solo flute), CEDAR MOON (which won the "Native Heart" category at the Native American Music Awards), PRAIRIE RUNNER (the title track is about the American buffalo), SONGS OF WINTER, TOUCHING QUIET and RETURN TO BALANCE (the soundtrack for the DVD, RETURN TO BALANCE: A CLIMBER'S JOURNEY, starring world-class rock climber Ron Kauk). At first Jeff performed solo shows, but after a few years his brother Randy showed up and began sitting in on bass and brought other musicians with him including Ted and John Natale (Randy, Ted and John had played together in a popular regional alternative rock band called Blue Yard Garden). It went so well that they began recording together. Randy Ball, who has been playing bass since 1988, draws inspiration from musical acts such as Bela Fleck and Victor Wooten as well as Martin, Medeski & Wood. Natale's influences range from the soul of James Brown to the alternative-rock of The Fray, Pete Yorn and Sparklehorse. John's latest inspiration comes from listening to singer-songwriters such as Van Morrison, Dwight Yoakam and David Gray along with rockers like White Stripes. Jeff has an affinity for Peter Gabriel, Sarah McLachlan, Sting, Jesse Cook and Bill Miller. In the past few years The Jeff Ball Band has performed at many festivals and powwows, often large outdoor concerts. They regularly incorporate Native American dancers into their shows. In addition, the band has performed onstage with Mary Youngblood, Bill Miller, Arvel Bird, and Gilbert Levy and Suzanne Teng. Jeff also played live with R. Carlos Nakai. "We don't play traditional American Indian songs," Jeff says. "When the Indians first started making flutes hundreds of years ago, they were only used by young men for courting. They would go out into the woods and listen to the wind in the trees or the birds singing; and each flute-player came up with his own music to play for the woman of his choice. That individuality is the tradition I am following. There is no point in copying what others are doing. We want to create a new path in our genre. This isn't our ancestor's flute music. This is American wood-flute music for the modern age." 2) Jeff, the video game composer and violinist, began composing video game music in 1998, and has since been credited in noted titles such as Gears of War 3, Red Orchestra 2: Heroes of Stalingrad, Monkey Island 2: Special Edition, Astroman (xblig), and Tiny Barbarian. Jeff was also the facilitator for Boom Library's first Guns session, which is used in Battlefield 3. Jeff plays in local symphonies and commercial fishes in Alaska during the summer with family.